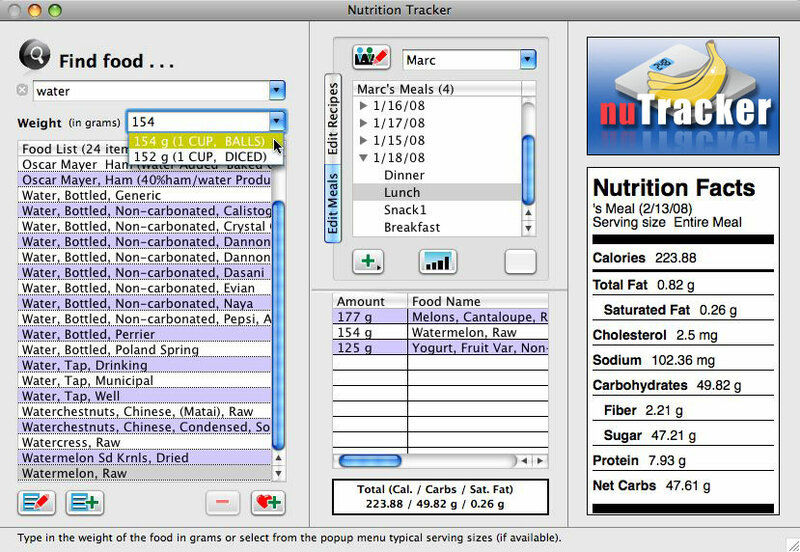 nuTracker is a forthcoming software program to help you track the nutrients in your diet (calories, carbohydrates, fat, saturated fat, sodium, fiber, etc.). It has a built-in database of thousands of foods -- just type a few letters of the name to instantly find it and see its specifications. All you need is a kitchen scale to measure the weight of the food you are actually eating and nuTracker will keep a log and track everything for you. This is the system I have used to lose 75 pounds so I know it works! Expandable: easy to add your own recipes and foods. Supports multiple meals and snacks and users. See a pre-release screenshot of nuTracker in progress here (note that this is not final and will change before release). nuTracker is not available yet, but we are looking for those interested in helping us test pre-release versions. If you're interested in being a beta-tester, please fill out this application form to be considered. Beta-testing will start in March 2008 so sign up now!